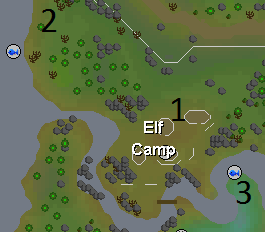 Welcome to the Elf Camp, which is located in the northwest area of Tirannwn. 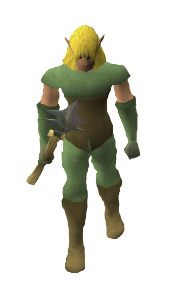 Lord Iorwerth is the leader of the Elf Warriors here, and you help him during the Regicide quest. The Elf Camp is located in the northwest corner of the Elvish lands of Isafdar, and just south of the large Elf city known as Prifdinnas. the Elvish lands can be difficult to traverse, and you may find the map of Isafdar useful in finding your way to this small camp. Inside the camp there is a useful fire that never goes out (handy for cooking the rabbit and fish you can get nearby). 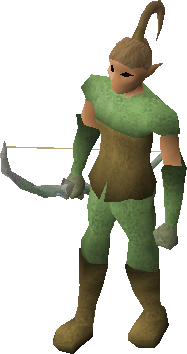 There are also several Elf Warriors that can be killed for Slayer assignments. In the southern building there is a Loom which is used during the Regicide quest, and which can also be used in the Crafting skill to weave items such as baskets, sacks, and Milestone Capes. You will also find Lord Iowerth here, whom you may have to talk to for a level 3 Treasure Trail clue scroll. 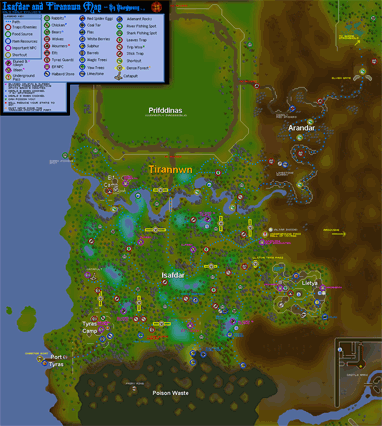 He is also the evil ruler of Prifdinnas and is fighting the rebel Elves in Lletya and their human ally Tyras, who is the king of West Ardougne. Northwest of the camp are 2 Fishing spots for Sharks and Big Net fishing. Nearby are lots of level 2 Rabbits. Southwest of the camp are many fishing spots for lure and bait fishing.